Family Room Blue Poppy Resorts . Book Directly, Lowest price guranteed. 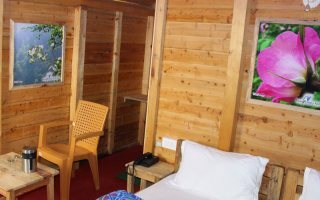 Blue Poppy resorts in Auli has seventeen wooden huts with modern facilities. 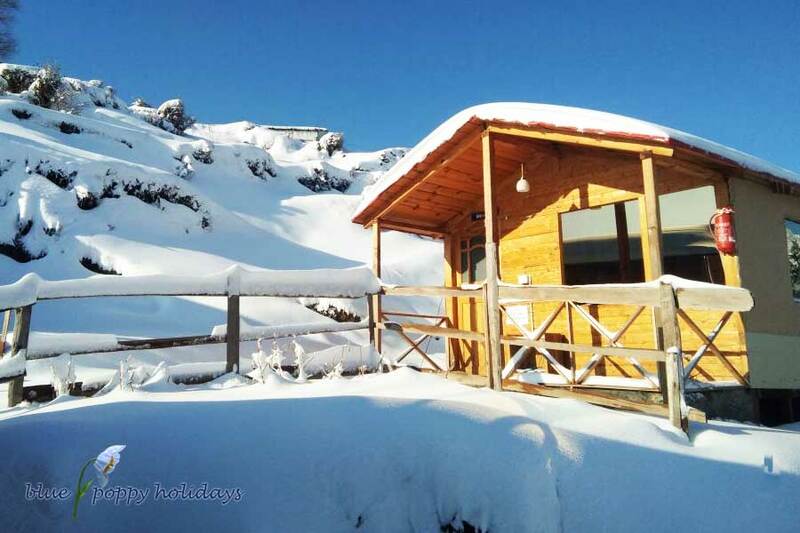 The Blue poppy resort is located as most beautiful location in Auli. You can visit anytime during the year and you will be greeted with different type of landscapes according to the season of visit. You can see clouds in monsoon season, snow slopes in winter season and clear peaks in summer season. All the huts in the resort provide you a 180 degree view of the higher peaks like Hathi, Ghoda, Palki and Nanda Devi. This is the only resort in Auli which is motor able and Nada Devi is visible. 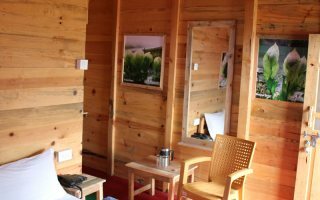 Our whole resort is constructed in alpine wood like Chid, Deodar and Raga. You will feel very nice fragrance of wood in the room. Apart from toilet floors and some pathways we did not use cement in our resort to protect the nature. This is heaven for birdwatchers as well. You can see lot of beautiful birds near the resort. We serve homely food and cook as per daily requirement. We never serve stale food. Food served is always homely. We are not the cheapest but we assure for value for money. Nature speaks, not for everyone but the ones who value it. Nothing in the entire world is more beautiful than hearing the birds chirping, looking at the clouds change color, observing the shining sun that’s full of light and boldness, greenery that’s God’s grace, and nature that never fails to make you awestruck. Auli is heaven in Himalayas, as this ski-destination in the literal sense brings you too closer to peace and yes, almighty. Situated in Chamoli district in Himalayan Mountains, this meadow is located at a height of 2500 mts to 3050 mts. To enjoy the beauty of this divine destination you definitely need to stay at some place like never before, and this service is availed by the Blue Poppy resorts in Auli. We at Blue Poppy resort are dedicated to let each guest have a lifetime experience in this serene destination. We are located at the most beautiful location in Auli, and we keep open throughout the year, where you can visit this celestial destination at any time of the year. Different seasons are set to bring different surprises for you, and thus, you shall visit Auli with just one expectation, and that’s to amaze yourself with what nature holds as treasure. The resort has a total of 17 huts, which have been designed including all the modern facilities that won’t take you even an inch away from your comfort zone. 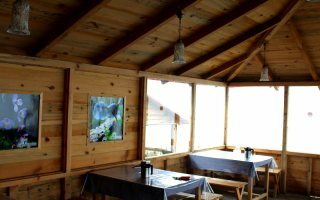 All huts are placed at an angle which ensures 180 degree view of the adjacent highly popular peaks like, Hathi, Godha, Palki and also Nanda Devi. The blue poppy resort is the only one resort in Auli which is accessible through vehicles, and gives you the complete view of Nanda Devi. Complete wooden architecture is used in construction with the sole motive to bring no harm to Mother Nature, and also allow the guests to stay closer to nature’s peaceful legacy. For bird watchers, this place is no less than a gift from Nature. You will be able to see a lot of bird kinds in their pure natural look, that’s surely going to be a treat for eyes. You get the most delectable food served in the Blue Poppy restaurant, where everyday menu differs, and you never get stale food served. Staying at Blue Poppy resort not only brings you closer to ultimate comfort, but we also let you get high in adventure with different adventure activities enabled. 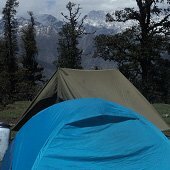 You can enjoy experiencing Trekking, Skiing and also Camping, which shall get you all that is expected from a visit in hill station. Visit Auli for at least once in lifetime, and consider Blue Poppy resort nothing less than a beautiful part of this divine destination. Inside the room, all the huts are constructed by Alpine wood only. 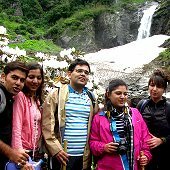 We carry out different activities apart from lodging in Auli. We are the leading trekking tour operator for valley of flowers and Gorson top. We offer professional tour packages for Valley of flowers and Kuari Pass. Our resort can be used as base for various treks starting from Auli. Auli is famous skiing destination in India and worldwide. 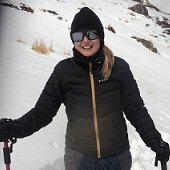 We offer professional skiing courses in winters. Minimum is three days basic course. You can come just for fun also. For first time trekkers, senior citizens and kids we also organize camping at Gorson top. Its a mild trek in the middle of the forest. Everyone loves it.